The weekend officially started off over at my brother’s new apartment. My family, (both parents even), the brothers’s girlfriend’s mom (one of the best Gumbo chefs I know), Trout’s family, and various other friends all got together to party. The function of the party was three-fold: as a housewarming for my brother and his girlfriend, as chance for everyone to get to meet each other, and to eat some of the best gumbo west of the Mississippi. In addition to the great company and excellent food, the evening included babies, dancing, beer, wine, gin & juice, drawing, impromptu jam sessions on pots, pans, air guitars, real guitars, vocal chords and any other instrument that could be found or invented, and tons of laughter. After the party we all went to the bar. This was probably not a good idea. Some of us were not allowed in the bar for various reasons – those of us that made it were kicked out in less than 15 minutes. Apparently the owner/manager of The Park doesn’t take kindly to grown men dawning some of their girlfriends accessories and acting like they are picking up on him. Getting kicked out was totally worth seeing that grumpy old man’s reaction though. Decided to take my first shot at the Friday Five today. 1. What did you have for breakfast this morning? If you didn’t have breakfast, why not? A grande latte, if that counts as a breakfast. I normally don’t eat breakfast, it upsets my stomach when I eat too early. 2. What’s your favorite cereal? 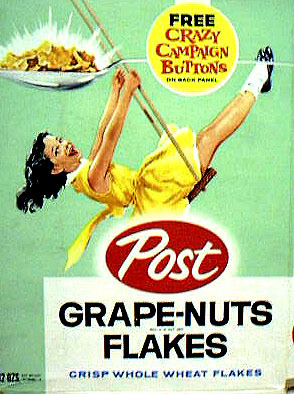 I can’t remember the last time I had a bowl of cereal but I guess my favorite would be Post Grape-Nuts. 3. How often do you eat out? Do you want that to change? Nearly everyday for lunch. Yeah, I want to change that. I’d save a boat load of money if I brought my lunch to work just 3 times a week. 4. What do you plan on having for dinner tonight? Got a recipe for that? I’ll be having true Cajun gumbo fixed by a true Coonass. Recipe not available. 5. What’s your favorite restaurant? Why? It changes, but right now it’s Tommy’s Thai because of their excellent food for an excellent price. I went out to dinner with my pops last night and will be doing so again tonight. We ate at a little (only 10 or so tables, and some additional seating outside that was not an option because it was snowing) place called Jerusalem Restaurant over in the Denver University area. The Jerusalem restaurant is owned by the Wahdan family and has been in operation since 1978. Dinner was really relaxed and it was an enjoyable evening. Last night I just finished up reading Nick Horby’s most recent novel “How To Be Good”. Nick Hornby, author of both “About A Boy” and “High Fidelity” (which is one of my favorite movies) has taken a different approach on his most recent novel. I can’t see this book being made into a movie, the book deals with issues and ideas that wouldn’t be easily transferred into the film media. Generally the novel concerns itself with what it means to lead a good life, how can we go about doing it, and how good does a person have to be in order to be happy? Hello and welcome to Hubsville. This is were it all begins. There are lots of changes to be made here and elsewhere. But if I know myself very well, lots will remain the same too. Enjoy your stay, however long it may be.